At the Movies: Here's looking at you, kid. — A.B.L.E. At the Movies: Here's looking at you, kid. It’s hard to believe we’re already halfway through this semester! The past 5 weeks have flown by as our adult ensembles have been bonding over discussions of our favorite movies, actors, and characters. We’re finding out that we share some favorites (fantasy movies like Star Wars and musicals like Hairspray are high on everyone’s lists) and some least favorites too (we have a collective dislike of clowns, especially the movie IT) . The process of devising a show is such a special way for our ensembles to get to know each other better, and to take total ownership over the performance. Slowly but surely, we’re molding our ideas into one cohesive script. 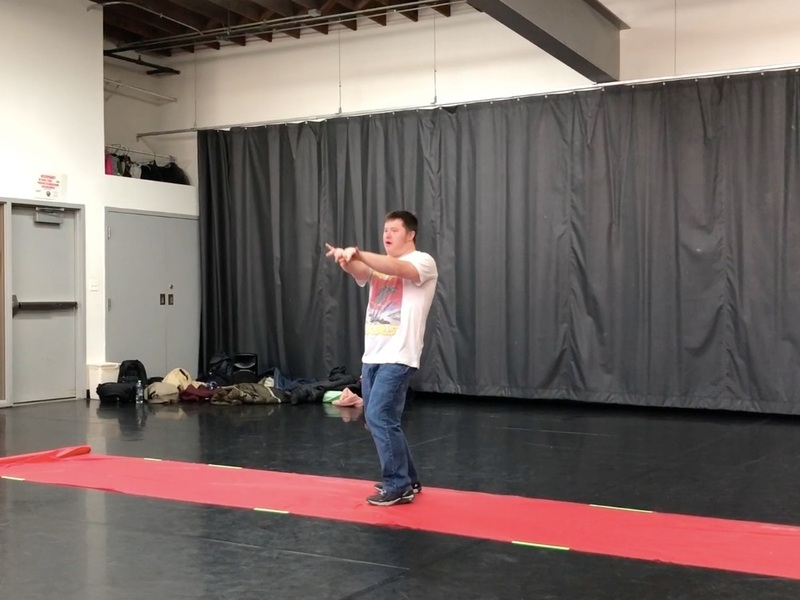 During week 4, we gave some extra focus to characters, with a variety of improvisation games and exercises to get us embodying how different people move and talk. A new favorite was the game “Who’s Knocking”. Actors would pull a character out of a hat, and we had to approach the door and knock as these characters. Some different characters we played with were: a spy on a secret mission, a superhero, picking up someone for a first date, a firefighter looking for occupants, and someone desperate to use the bathroom. We also played with scenes from some of our favorite movies and started thinking about which of these we’d like to incorporate into the performance. We’ve spent a lot of time talking as individuals and sharing personal preferences and ideas, so this week, it was important to come back together as a group. We played extra ensemble games this week like Circle Switch, Group Mirroring, and Go Ball to remind ourselves of the importance of listening, sharing, and teamwork. And then we really dug into our group movement pieces. The AM ensemble will kick off the show with a montage all about our favorite movie snacks. The PM ensemble will hit the red carpet celebrating their favorite movie stars. We enjoyed working together to set and choreograph these pieces which feature solos from each actor. The entire ensemble will join together for a fast-paced finale - it only takes one or two run throughs of this dance number to get our hearts pumping and rev up our energy. A Night at the Movies will incorporate a mix of monologues written by the ensemble, highlights from some of our favorite screenplays, filmed homages to our best loved characters, and group movement pieces. This show is truly ours, and we hope audiences will have as much fun watching it as we have had making it! See our ensembles in action on Tuesday May 14th at the Menomonee Club Drucker Center. Tickets will be onsale later this week. To get notifications, click here to sign up for our newsletter.